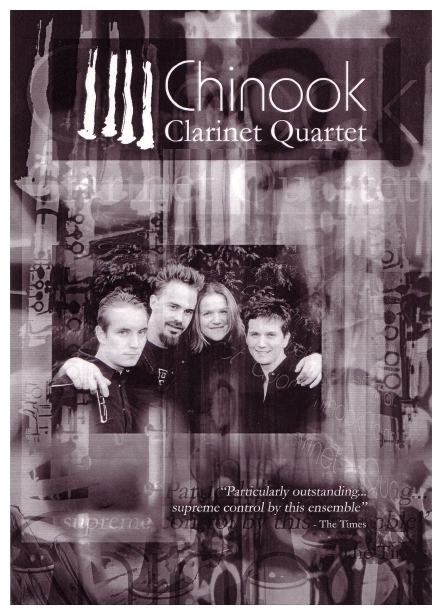 Chinook Clarinet Quartet has performed throughout Britain for more than 17 years. Their dynamic and innovative performances delight audiences by offering flexible and varied programmes. Their vast repertoire extends from arrangements of famous classical works to various jazz styles and contemporary music featuring many of their own commissions. Chinook have dedicated much time increasing the repertoire and reputation of this genre. 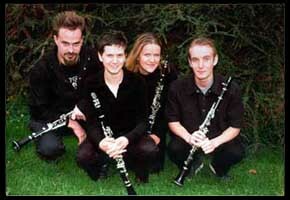 They have succeeded in extending the boundaries of sound in this medium by exploring new techniques, colours and textures. Their critically acclaimed performances and commitment to new music have put them at the forefront of the contemporary music scene, performing for both the Park Lane Group and the Huddersfield Contemporary Music Festival. Commissioned composers include: Simon Parkin, Julian Phillips, Kate Romano, Robert Keeley, Damien Harron, Dai Fujikura, Roger Marsh and John Stubblefield. Chinook apply the same standard of excellence to education projects with an enthusiastic approach in composition workshops and performance masterclasses throughout the UK, enabling them to create exciting new avenues for writers and performers to create music together. Competition success has seen Chinook promoted by BBC Young Artists Forum, the John Tunnell Trust, the Young Musicians Trust, the Park Lane Group, Live Music Now!, Eastern Arts ‘Making Music’and the South East Musicians Scheme. Concert venues have included the Bridgewater Hall (Manchester), Queen’s Hall (Edinburgh), Wigmore Hall and the Purcell Room (London). Tours have taken them as far afield as Hungary, Germany, Poland and New York. They have also broadcast for BBC Radio 2 and BBC Radio 3 and recorded two CD’s entitled Chinook and The Grace of Cunning and Deception.